Calif. Gov. Brown Intervenes, BART Strike Averted For Now : The Two-Way Commuters can rest a little easier — another threatened strike at the San Francisco Bay Area Rapid Transit system has been avoided, at least temporarily. California Gov. Jerry Brown has appointed a board of investigators to look into the contract dispute that had threatened to shut down the system. 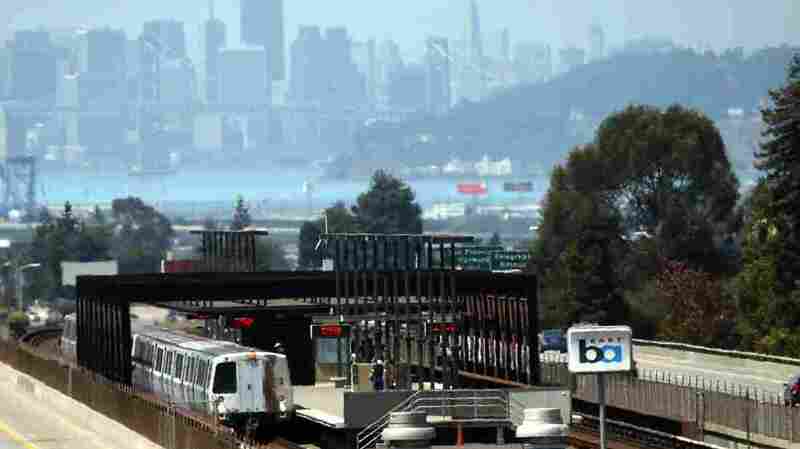 A Bay Area Rapid Transit (BART) train sits in the Rockridge station on Friday in Oakland, Calif. San Francisco Bay Area commuters were bracing for the possibility of a BART strike as a 30-day contract extension was set to expire Sunday at midnight. Commuters can rest a little easier — another threatened strike at the San Francisco Bay Area Rapid Transit system has been avoided, at least temporarily. California Gov. Jerry Brown has appointed a board of investigators to look into the contract dispute that had threatened to shut down the system. In the order, Brown said, "For the sake of the people of the Bay Area, I urge — in the strongest terms possible — the parties to meet quickly and as long as necessary to get this dispute resolved." Union leaders and managers of BART had returned to the bargaining table over the weekend. Union employees were to walk off the job at midnight if a new contract had not been reached by midnight Sunday, local time. Brown's order was issued around 10:30 p.m. Sunday. Last month, BART workers walked off their jobs for four days.